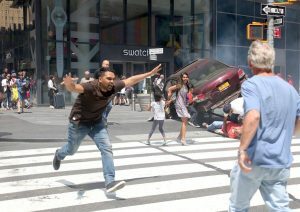 Times Square in Manhattan, the crossroads of the world, became a scene of panic yesterday afternoon as a car drove the wrong way down a one-way street and plowed into pedestrians, injuring dozens and killing one. Richard Rojas, a former Navy vet and current resident of the Bronx who has been arrested twice in the past for DWI, was apprehended at the site while trying to run away. “We are all a little surprised” said an NYPD officer at the scene. Like everyone I thought it might be an terrorist attack but then my sergeant informed me that speculation like that was racist. “Islam is the religion of peace” he told me. I have to agree. No, seriously, I have to agree. He’s my sergeant. But then he told us that he was “extremely concerned” about Russian collusion in the 2016 Presidential election. I mean who isn’t concerned about Russian collusion into our electoral process. I watch CNN! Eyewitnesses to the crash expressed dismay at the carnage and, once informed of Rojas’ motives, disgust at President Trump. “I heard a car and then screaming” said a tourist who was in Times Square at the time of the accident. I rushed over to one person who had been thrown into the air by the car. He was moaning and saying, “Why? Why?” I held his hand and reassured him. “Don’t you worry. Donald Trump will pay for colluding with Russia” I told him. He smiled at me and said, “Good. Now I can die in peace.” Then he died. I haven’t been so emotionally drained since Hillary lost, no doubt because of collusion between Trump and Putin. CNN and MSNBC both interrupted their scheduled programming to report on the message sent by a concerned citizen. “I am reporting live from Times Square, a scene of chaos, fear and hope” reported Wolf Blitzer. Chaos because a car has plowed into pedestrians. Fear that loves ones may be injured. But also hope. Hope because finally America’s citizens are rising up and telling Donald Trump that he will not get away with colluding with Putin to overthrow the American electoral system. If one person can stand up to Trump then all America can. In Washington, D.C. Donald Trump, the illegitimate president, stonewalled the press when asked about Rojas’ statement in Times Square. “I am sure this person had other motives for crashing his car into pedestrians” said the guilty, treasonous president. Perhaps he was drunk or high. But I doubt he did this as a protest. That’s just a ridiculous statement. I mean seriously. Can’t you guys in the press report something truthful for once? Despite his attempts to throw suspicion off his administration for colluding with Russia and perhaps because of disgust at his racist statement about the Puerto Rican driver who was just trying to do his patriotic duty, the American people remain united in their desire to impeach Trump. The NYPD has asked citizens who also with to send a message to Trump that he will not get away with his collusion to try to plow into pedestrians during non-rush hour times. “People got to get to work and they don’t need anyone sending a message of anger over Trump’s collusion with Russia during their commute” said NYPD Commissioner James P. O’Neill. In a live interview last evening on The Butchie “Madcow” Maddow show anti-Chic-filet activist George Soros pledged to throw Rojas’ bail, replace his wrecked car along with an annual membership in AAA and a free meal at B.B. King’s Times Square location. Yet more evidence, IF THAT WAS NEEDED, of Putin’s spy, TRUMP, selling out his country like the rascist he is. Impeachment today! Impeachment tomorrow! Impeachment forever!